Returning from vacation is never easy, your pleasant idyll abruptly replaced by the frenetic repetition of daily life. Yet for myself there is one consolation. I have my kitchen again. The first Sunday after returning from Australia I spent ensconced in this room, cooking and baking with renewed vigor, quietly content once again to be amongst bubbling pots and the perfume of a gently blooming sourdough. The change from balmy Australian skies to leaden Seattle rain was jarring; the Texan and I found ourselves shivering beneath layers of clothing and huddling by the radiator whenever possible. We needed a hearty meal, something to wake up the senses, warm our bones, and recall us both to warmer climes. I decided to go Moroccan. 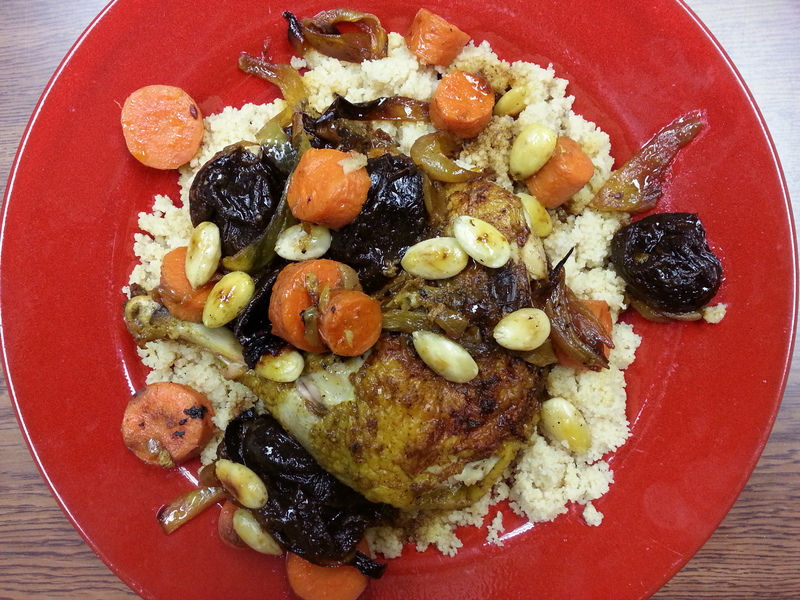 This recipe is a riff off a chicken tagine from Paula Wolfert, an authority on Moroccan cuisine. Instead of chopping the chicken up and laboriously cooking it in the tradition manner, I simply rubbed it with a mixture of Moroccan spices, let it sit for while, and then roasted it whole, with sliced onions and a lavish coat of olive oil. During the last 15 minutes I added prunes that had been simmered with cinnamon. Later I drew the chicken from the oven, haloed by the scent of cumin and ginger, its skin burnished orange the color of autumn leaves. The sauce was rich and sweet with cinnamon and prunes. Cradled by couscous and garnished with crispy fried almonds, it makes a supremely satisfying meal for a weather-beaten day. Note: it is even better with fried, salted Spanish Marcona almonds! Clean chicken and pat dry. Combine all spices with about 2 tablespoons of olive oil in a small bowl and mix to form a paste. Rub this all over chicken, inside and out; let stand at room temperature for an hour. Meanwhile, place prunes and cinnamon stick in a small sauce pan and cover with water. Bring to the boil and then lower to a simmer for 15 minutes. Set aside. Preheat oven to 425F. Tie chicken’s legs loosely together and place in a large roasting pan. Scatter onion slices around, drizzling them with a little olive oil. Roast for 20 minutes, lower oven to 375F, and continue cooking for 45 minutes, basting with the juices every 15 minutes. Drain prunes, discarding cinnamon stick, and add to roasting pan with the onions. Roast for another 15 minutes or so until chicken is done and juices run clear when pierced with a knife between leg and thigh. Cover and allow to rest while you make the couscous. Sprinkle with the fried almonds and serve with bitter greens or carrots. I fantasize about the cake the way most girls fantasize about the dress. In high school, during my first uninhibited flush of baking ambition I envisioned a gargantuan edifice off cake consisting, somewhat bewilderingly in retrospect, of crisply starched meringue layered with raspberries and a delicate sponge drenched in Frangelico, or Sherry, or possibly both. This was my excessive phase. In college, I fell in love with the idea of a traditional English wedding cake. A hearty ordeal of brandy soaked fruit, it is blanketed in marzipan and frosted with a fine white royal icing. More than a festive centerpiece, this wedding cake is so durable that British couples traditionally saved the top layer for the christening of their first born child. This was my romantic phase. Since then I have entertained various fantasies, fluctuating with the mood of the hour. From Italian tiramisu to a ‘cake’ formed entirely by layers of truffles filled with single-malt Whisky (you may notice a theme by now), these visions have ranged from modest to outlandish. Now that I am engaged, I have become more circumspect. Visions of grandeur have surrendered to the greater appeal of a happy, stress-free wedding. The cake must be delicious, without compromising flavor or texture for glamour. It must be easy to make. I know myself too well and attempting anything remotely complex will inevitably result in a meltdown, the bride buried under the rubble of a failed cake, drowning in tears and butter-cream. It must be gluten and dairy free. Tragically, several of my nearest and dearest friends cannot enjoy these foods. Perused the web in growing desperation, I stumbled across a blog post by David Lebovitz, a food blogger living in Paris. 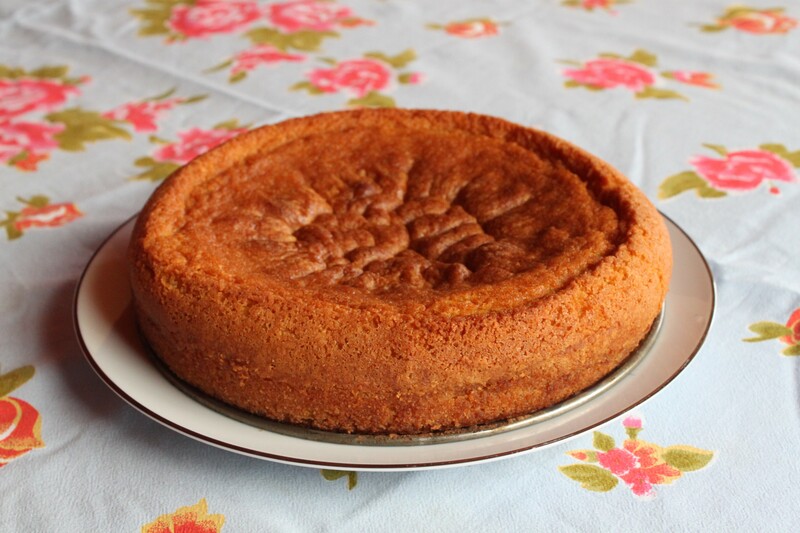 The recipe is for simple yet versatile almond cake, adapted from one served a the famed Chez Panisse in Berkeley. I was intrigued. After some thought I gave it a go, substituting almond four for the white flour and Earth Balance shortening for the butter. I iced it with a dairy-free chocolate frosting and then served it forth. The result was better than I’d dared hope. The crumb was moist and delicate, fragrant with sharp, sweet almond and blanketed by rich dark chocolate. Not yet perfect, it was nonetheless an encouraging step in the development of a lovely wedding cake. The recipe below is shamelessly stolen, almost verbatim, from the one by David Lebovitz. You can find the original along with helpful commentary and advice here. Melt the chocolate and coconut oil together in a saucepan over a low heat. Whisk until lumps have dissolved, then remove from heat a whisk in the vanilla. Leave to cool in fridge for 20-30 mins. Whisk until thick and fluffy. Ice the cake immediately as the mixture hardens quickly. In the next test I will experiment with different fillings and discover how the cake holds up when layered. Note: I did consult my fiance (The Texan) on his preferences but he didn’t seem the slightest bit interested, bless him.